Meyer was thrilled with Miller's play. Day Two of Urban Meyer's first fall camp at Ohio State may have been the best offensive practice since his arrival. Quarterback Braxton Miller delivered the goods and wide receivers Devin Smith and Evan Spencer finally looked like the skill position players Meyer offenses always covet. Another bright spot has been the emergence of Meyer's first recruiting class. The two-deep is littered with freshmen with everything pointing to several playing Sept. 1. There was also good news on the injury front: Defensive end Nathan Williams and running back Jordan Hall are ahead of schedule. Urban Meyer’s rallying cry today was plus-two or stay two steps ahead. In a team huddle, Meyer barked orders to always go the extra step, or in this case, two extra steps, during practice. He said it’s not about being rah-rah, it’s about improving. During his impassioned speech, Meyer raised his voice at Kyle Dodson and other players who weren’t looking at his eyes. It was a very impressive speech by Meyer. Curtis Grant was absent because his grandfather is having health issues. Grant is with him in Virginia, but Meyer said he should be back tomorrow. Connor Crowell worked with the first-team in his absence; Luke Roberts was second string. Jake Stoneburner and Jack Mewhort both practiced with the first-team today. Meyer said both of them are on schedule to be under scholarship when the fall semester begins. Bri’onte Dunn worked with the third-team, ahead of Warren Ball. Meyer said he is waiting on the legal process to decide what happens with Dunn. He said if “charges stick”, Dunn will be punished. Carlos Hyde was the first-team running back, Rod Smith second. Smith had to have his ankle re-taped at one point. Jacoby Boren was limited for much of practice because of his shoulder injury. He was seen running part of the time to help stay in the flow. Antonio Underwood was the second-team center. At one point, Ed Warinner yelled at Underwood for messing up and told the ESPN camera to make sure it got on TV. Josh Perry ran off the field midway through practice with an apparent hamstring injury. He sat in the WHAC for the rest of practice stretching out his legs. Nathan Williams and Jordan Hall are reported to be “slightly” ahead of schedule, according to Meyer. But he emphasized that it’s important for them not to be rushed back. Hall had a boot on his right foot. 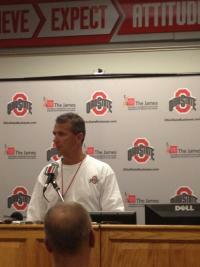 Meyer said his "heart bleeds" for Williams because he knows how difficult it is for him to have football taken away. During defensive drills, Vrabel could be heard shouting, “Perfect Adolphus, Perfect Adolphus.” After practice Meyer said a number of freshmen would play this fall. He specifically mentioned Noah Spence and Jamal Marcus. Meyer said Jamal Marcus will run over anything to get from Point A to Point B. He said he'll find a way to get him on the field. Spence and Washington were on the third-team D-Line, along with Se’Von Pittman and Chris Carter. Devin Smith, Evan Spencer and Philly Brown were the first-team wide receivers. Smith and Spencer were two guys Meyer said could fill Hall’s role. He said several wide receivers will have to adapt to their roles and help fill slots. When talking about the offense, Meyer said, "I can tell you this, they did something this summer." His comments were based on the offense’s execution. He singled out Smith and his solid practice. According to Meyer, Smith was the first player in 17 practices to run a perfect nine route. "My gosh do we need someone like that,” Meyer said. Meyer said he wants the offensive skill guys to play fast. He said the coaching staff will have to figure out a way to make that happen. Michael Bennett and Adam Bellamy were flip flopped on the first-team defensive line today. Bennett first, Bellamy second. JT Moore, Joel Hale and Steve Miller rounded out the second-team. First-team O-Line was as expected. Taylor Decker was on the second-team, but Reid Fragel’s performance was less than perfect. John Simon and Bennett each had a fairly easy task of getting around him. Another freshman on the two-deep was Cam Williams, who backed up Ryan Shazier. Mark Mangino took in Ohio State's practice today. He's friends with Warinner, who was Kansas's OC when they won the Orange Bowl. He is also old friends with Meyer. Former OSU head coach John Cooper, a regular at practice, was also there. Something Meyer noticed, he said, is that it's easy to be average. He said he's going to push players to strive for greatness. Meyer said CJ Barnett never accepts being average. Playing for a championship is something Meyer has always been able to do in a season. But that is not the case this year. He said he might have to create a championship, but he’s hoping the team is self-motivated. If they aren’t, he said he’ll have to think up something to motivate them. There was a team meal held last night. The team received a team manual at the dinner. Meyer commented on how odd the start of practice was because of Finals. That was part of the reason why he split up Day One between veterans and freshmen. He also said he did it to help acclimate the young guys. Meyer said they taught them how to tape, stretch, etc., so when they practiced today, they knew the routine. ESPN was filming the practice for the special they are doing on Ohio State. Meyer and other coaches were mic’d, and Garrett Goebel had a camera strapped to his chest part of the time. Drew Basil was automatic on field goals, while Ben Buchanan was inconsistent with punts. I saw one that was a complete shank. Ohio State SID Jerry Emig noted that the temperature difference on grass and field turf can be as much as 30 degrees. The team practiced on grass fields today because of the temperatures, which hovered near 90. The freshmen have silver helmets with a black stripe, sort of like the Oakland Raiders, to distinguish themselves.